Nottingham Playhouse. In rehearsal with Wonderland cast. – East Midlands Theatre. 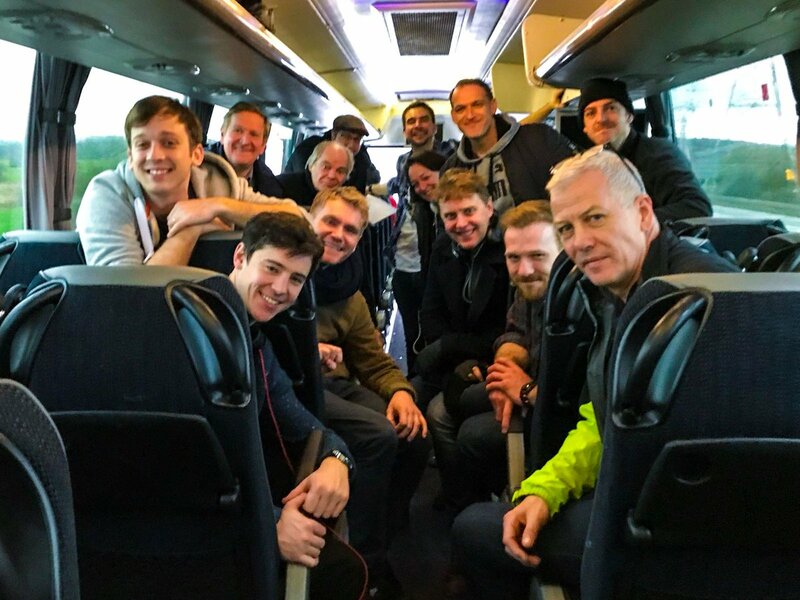 East Midlands Theatre was invited to attend a professional rehearsal for the upcoming Nottingham Playhouse production of Beth Steel’s coal mining play Wonderland. 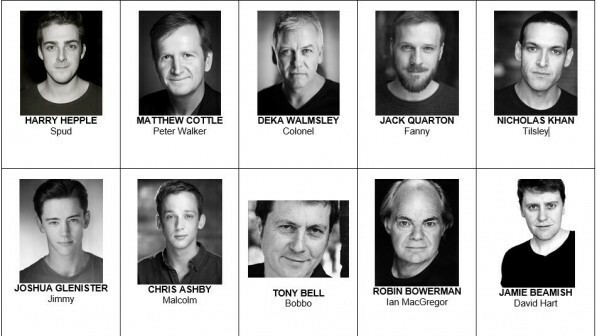 So I spend the afternoon in the fine company of director Adam Penford and the all male cast. 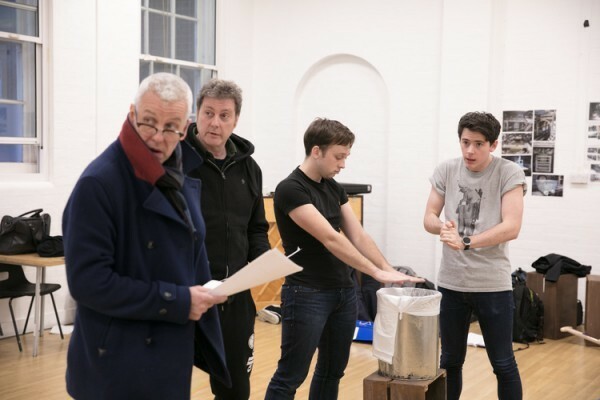 Having read Beth Steel’s extra-ordinary and very accessible play I was keen to observe a rehearsal in progress and meet the cast as listed below. The rehearsal room is typically marked out on the floor with coloured tape marking areas of action and placement of larger props and boundaries of the set. This is done by stage management and an important stage in expressing to the creative team and actors the set designers construction and intent. In one corner sits a heavy looking miners’ truck and behind it a moveable set of steps hosting twenty or so miners’ helmets underneath. 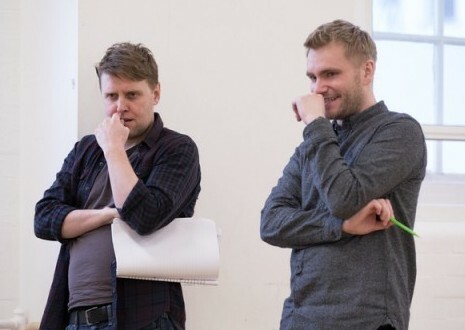 Various other props like a snap tin and cigarettes are located around the room and Adam directs both on stage and from behind his table with assistant director Felix and sound designer Jon Nicholls. On the back wall are print outs of photos of the set model conveying a massive looking coal mine interior glistening with coal and various gantry, steps, and rail tracks plus the cage that transports the miners into the depths. The imposing set design by Morgan Large also shows other exterior/interior locations such as a restaurant table with chairs and office spaces. Other printed imagery shows real life interiors such as a banner for the Union of Democratic Mineworkers and the gates at Welbeck Colliery. Similar archival imagery shows a paddy train, Tilsley’s office, miners in the showering room, MacGregors’ office and a scab bus. I get to say a brief ‘hello’ to the actors before the rehearsal starts and Adam begins with the Orgreave scene with the pitched battle between miners and police. Beth Steel’s script brilliantly captures the danger and tensions between the massed miners versus the general and Metropolitan police force and the police cavalry. It is exciting to watch the actors go through the scene over and over and consider the subtext of their lines and, in some cases, the dark humour. 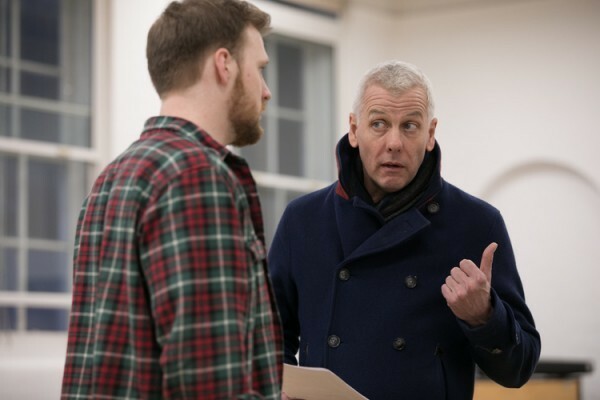 The cleverly written play also brings in brief reports of other acts of violence from the same period such as the IRA Brighton bombing and the fatal shooting of police woman Yvonne Fletcher outside the Libyan Embassy in April 1984. For the miners these are desperate and highly emotional times for workers who just want to continue in their jobs and provide for their families. The camaraderie and tough spirit of the mining communities is very evident in Wonderland and demonstrated in today’s rehearsal by an exemplary cast. The tone is an emotional roller-coaster as we hear of the miner’s later plight in struggling to exist during a prolonged strike. One minute there is dark humour and banter and next we witness the miners scraping up bits of coal to heat their homes. In one very moving case we hear a miner speak of having to kill a pet dog because they can’t afford to feed it. After a break the actors go through a line rehearsal of the next scene. The social and financial impact on the miners and their families is heartbreaking. This is counter balanced with dialogue that highlights the hard politics of the time which I imagine will still be raw in the minds of the ex-mining communities today. 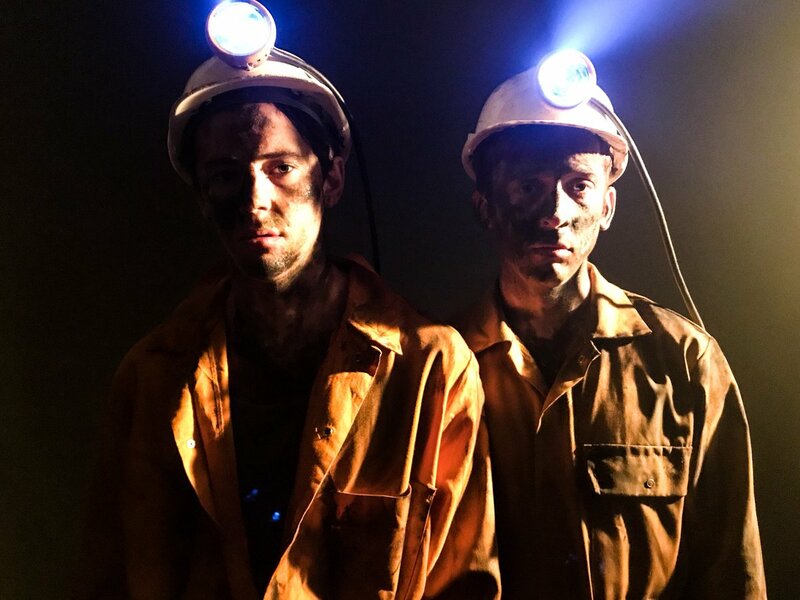 As part of the process of the creative understanding of Wonderland director Adam Penford told me how much the cast got out of a recent visit to the National Museum of Coal Mining for England in Wakefield West Yorkshire. The museum is based at the site of the Caphouse Colliery in Overton. Adam says that the mine is shallow compared to the Welbeck Colliery but the actors got to experience going 140m underground in the cage and were most taken with the banter and knowledge of the ex-miners who guide visitors through the history of the coal mine. 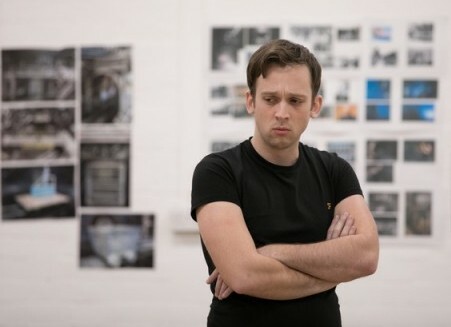 Thank you to Adam Penford and the Nottingham Playhouse cast of Wonderland for the opportunity to sit in on what was a very engrossing and educational afternoon rehearsal. I can hardly wait until press night to witness the full show. 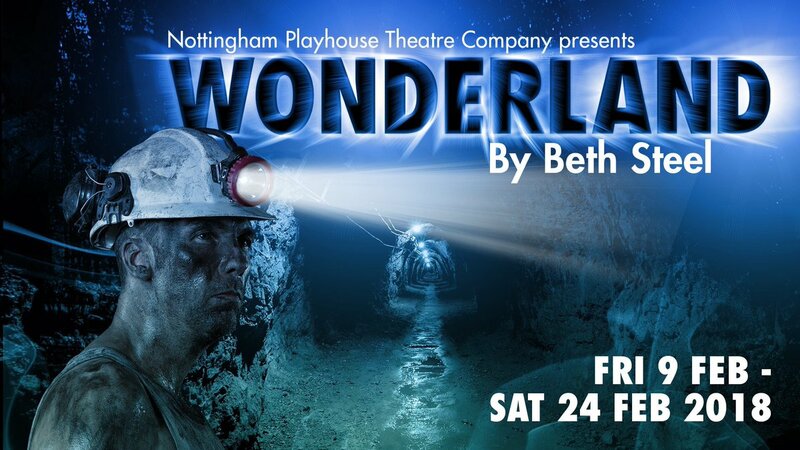 Wonderland runs at Nottingham Playhouse Fri 9th February – Sat 24th February 2018 and is artistic director Adam Penford’s inaugural production for Nottingham Playhouse. Rehearsal photos by Darren Bell. National Theatre tour Hedda Gabler £5 ticket offer for under 26 year olds. Nottingham Theatre Royal.